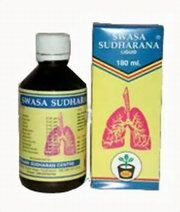 Swasa Sudharana is very affective in the treatment of all respiratory problems including brancoil's allergy, sinusties, oesinophily, sneezing cold etc. It can be taken 5ml before breakfast and 5 to 15ml after dinner twice. Corpulmanale (Cardiac Asthma), bronchial asthma, eosinophilia, bronchitis, allergic rhinitis (Hay fever), sinusitis. Usage : It has to taken for 6 months to 1 year. Chronic patients are requested to use it above 1 year also. Do not stop medicine suddenly after relief and continue the medicine by reducing dosage as advised by the Doctor. Its a superb product for asthamtic patients. My husband have acute asthma and he doesnt leave the house with inhaler in hand. By taking the swasa sudharana , his health improved from 2nd day itself. Now he even forget that he has asthma anytime in his life. I am Reffering for peoples who were suffering from Asthama,which gives wonderfull results. Its an miracle product for Asthmatic patients. Explore more Asthama Sudharana Centre products. I am Reffering for peoples who were suffering from Asthama,w ..